Nothing says spring more than when that first stalk of rhubarb, protected by its huge lily pad like leaves, is plucked from the ground. That moment took so long to come in Minnesota this year. Winter was relentless, as evident by the snowfall we experienced all the way through the end of April and highs hovering around the mid 40’s. But in time, we were rewarded and now we sing the praises of morels, ramps, spring onions, radishes, and the ever special rhubarb. I was lucky enough to grab an arms full of it from my mother and grandmother’s backyards when I was home a few weekends ago. First I made a Rhubarb Blueberry Crisp that was dynamite, studded with oats, roasted flax seeds, and sunflower seeds. 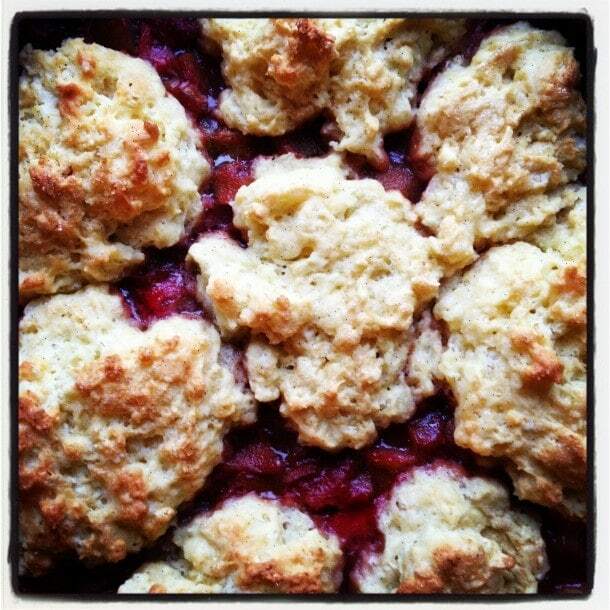 Having never made a cobbler, I decided to make that my next venture after drooling over a blueberry version in Saveur. 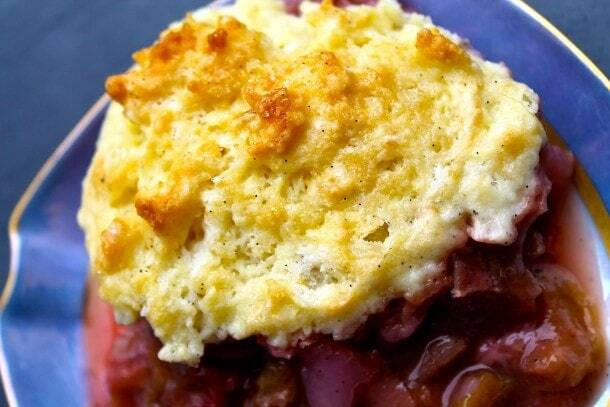 Plus, with my new favorite gluten free flour blend, Cup4Cup, I was confident that soft, fluffy biscuits that float like clouds on top of the roasted rhubarb was possible. What really sets this cobbler apart from all the rest: vanilla bean & booze! I just love the flavor that real vanilla bean seeds impart, their little black specks barely visible, but a hint to that extra something they always add. And then, to give the rhubarb redness and another layer of flavor, I added some of my boozy cherry brandy. Yes…..
~Roasting the fruit for 20 minutes, then topping it with the biscuit dough and returning it to the oven to finish is best. By doing this, the juices released from the fruit are not soaked up by the dough, which can result in a dry cobbler with soggy biscuits. ☹ Instead, you get a bubbly, thickened filling with biscuits that float perfectly on top. ~Letting the fruit macerate overnight helps bring out it’s natural sweetness and syrup so that you don’t have to add a lot of sugar before baking. ~Making sure your butter is extremely cold for the best results. I froze mine for a few minutes to ensure it wouldn’t melt when I was using my fingers to blend it into the flour. ~Even though the smell that will fill your kitchen is divine, let the cobbler sit for about 45 minutes before sneaking that first bite. This allows the fruit mixture to thicken a bit more. 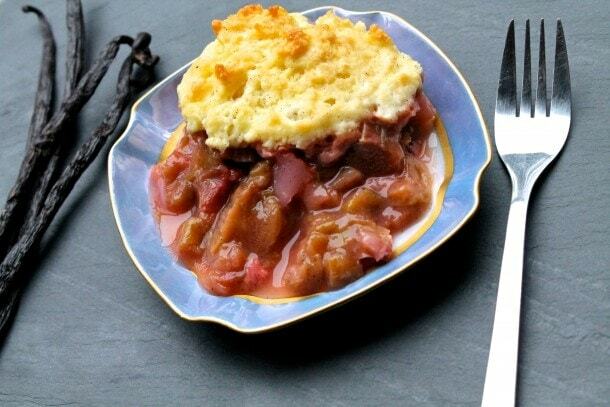 The night before you plan to make the cobbler, stir together the rhubarb, 1/4 cup of the sugar, vanilla bean seeds, salt, cornstarch, and brandy and let macerate in refrigerator. The next day, preheat the oven to 375 degrees. Add remaining 1/4 cup sugar to fruit and pour into a 9 x 9 inch square pan (or similar volume baking dish) and roast for 20 minutes (it should be bubbling). Meanwhile, mix together dry ingredients in a bowl. Cut in butter with pastry blender or hands until texture is of coarse crumbs the size of peas. In a different bowl, whisk together vanilla bean, milk, and egg, then add to dry ingredients. Mix until the dough just comes together. After fruit has roasted for 20 minutes, remove from oven and drop dough on top in heaping spoonfulls, scattered evenly across. Return to oven for another 30-35 minutes, or until tops are browned and the filling is bubbling. Let cool, then enjoy! Will keep in refrigerator for 3 days. P.S. If you’ve got a stockpile of rhubarb, you’ll want to try this Upside Down Strawberry Rhubarb Cake too! For some insane reason, I passed on cutting rhubarb at the lake when I was there last weekend, and now, after reading this, I’m kind of kicking myself. That and the heaven-sent deluge of rhubarb recipes I’ve come across, all with vanilla beans, roasted to perfection and topped with something fluffy. I need that rhubarb. Now. 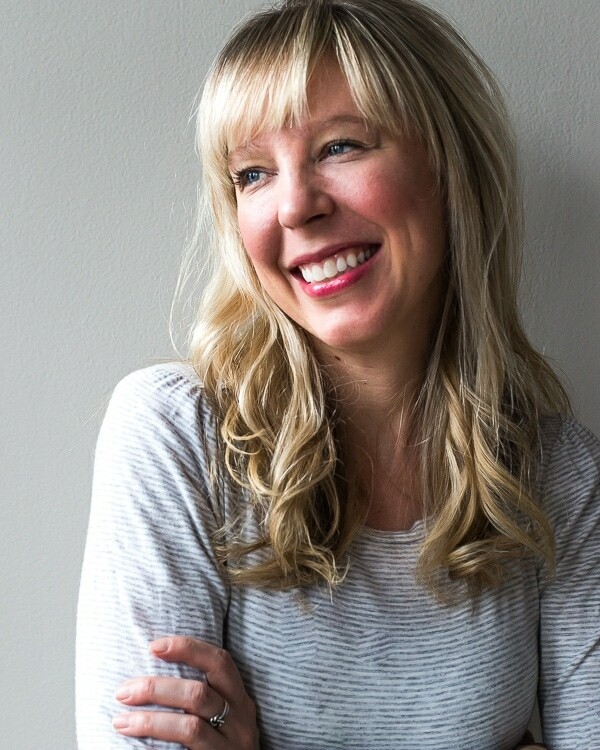 Kate, your weekends at your cabin have looked so perfect! This is the 3rd rhubarb dish I’ve made this year and I just can’t get enough. For this one particularly, the vanilla bean works really well and you don’t see the two combined that often. I like it because it adds another dimension instead of adding a lot of sugar, which sometimes people do because they think the rhubarb is too tart. But I think a little tartness is just perfect. See you on Tuesday!